Early in her planning, we seven children had each been asked by Mom if we thought it was a good idea for her to go on a 1972 trip to the Holy Land. We certainly did and were so glad she wanted to do it. Her notes reflect her own love of travel, made as they were ten years after Dad’s passing in March of 1962. This was a significant “solo journey” for her, made in the company of a group of Bible-believers brought together by the Lutheran Bible School in Seattle. Her notes give evidence of her ability to maintain old friendships and enter into new ones; and they remind us that there is much extra-Biblical historical documentation of the journeys and works of Jesus, the Christ. The Scripture references in the text were in her original notes. Every mention of a city or location is not bold, but the first mention and sometimes additional ones are, if it helps us to “see where we are.” I have added a few brief italicized notes for clarification. One caveat: Her notes end on March 13 with several days of the tour schedule remaining. I have included the remaining part of the itinerary after her final note of their bus trip to Bethlehem. I would assume that the wind-down of the trip became very busy as they traveled through Tel Aviv, Athens, Corinth, Rome and Copenhagen in a flurry of arrivals and departures as they headed home and the writing got set aside. So get your coffee and your muffin and let’s see where Edith went and what she was thinking in 1972. March 3, 1972: Left Williston at 5 pm. Nels and Ann took me down. We visited Mother before I left. Had a good night. Slept some. March 4: F….met me and took me over to Mrs. Elfstrand, as his boys were sick with sore throats and cold and they didn’t want me to get it from them. Alyce and I went with Lillian and Pearl and Mrs. Bergstrom shopping and we had lunch at a nice place. Alyce found a dress she thought fit me, so I tried it on, and liked it very much, so bought it. A navy red and check knit. March 5: At Alyce Elfstrand. Mary came over and took us out to a lovely breakfast. We came home and visited. About 2 pm, F and M came and I took them out to dinner. Alyce and Mary had other things to do, so didn’t want to come along. In the forenoon we also stopped at Mary’s apartment and at Mrs. Bergstrom’s apartment. Both were very nice. March 6: Had a quiet forenoon to get the last details done. Alyce went to work at 8:30. F came and picked me up at 1:00 pm to go to the airport. Didn’t take us long to find Dorothy Kluge and Arlene Baker there who were also going on the tour. They were such easy and friendly ladies to meet. We left Minneapolis at 3:00 pm. Arrived at Chicago 4:09 pm, where we met the group from Seattle. That was very interesting. F had given me a beautiful orchid corsage when I left Minneapolis. Many of the others had corsages, too. We were all so happy and thrilled to be starting on our trip. March 7: We have had a beautiful flight over, and at 1:30, we saw a lovely sunrise. Really a short night. It was daylight at 1:30. We arrived at Copenhagen about 4 am our time, but was 10:45 Copenhagen time. Had lunch here. Delicious asparagus soup. We waited 4 1/2 hours here for a plane to Cairo. We arrived there 12:30 March 8, right after midnight. Were taken by bus to Shepherd’s Hotel. We used Skandinavian Airlines from Chicago to Copenhagen, and from there to Cairo. They were such very good meals on the planes. Really delicious. Our hotel in Cairo is right on the River Nile. There is (sic) lots of palm trees here. We were down in Cairo shopping. There’s (sic) so many people selling on the street, we can hardly walk for them, but was fun shopping. Seems everyone is selling camels. Any size. Our 24 people came away from Cairo with about 75 of them. On our way to Cairo, we landed at Vienna and Istanbul. Vienna looked beautiful, what we could see from the airport. They had such modern, nearly all glass buses and the terminal looked so shiny and clean. Istanbul was a different story–so poorly lit, and in the terminal so few lights on, and everyone looked so dark with their covered heads and long robes and no one spoke English. So many little shops in the terminal, but we didn’t buy anything. Was dark and scary. March 8: Cairo. Weather very nice. A bus picked us up at 9am. Dr. Farid was our guide for the day. A very intelligent and well educated man…he spoke fairly plain English. It was always very correct, but sometimes they spoke so broken English it was hard to understand. Dr. Farid was such a fast walker we almost had to run to keep up with him. We visited the large Egyptian Museum first. Was so interesting. Dad would surely have enjoyed that. There were so many statues and things they had excavated from hundreds of years before Christ. We also went to the Pyramids today. They are so large and so much rock, we wonder how they ever made them. Dr. Farid also took us down under the Pyramids thru a sort of tunnel. It was an experience, but none of us thought we’d want to do that again. Part of the way, we couldn’t stand up. Had to walk stooped over, but we got down to the lowest level where they had used the room for a burial place. Mom didn’t ride the camels! There were many camels and Arabs around here. 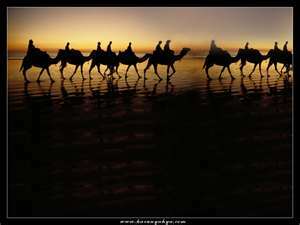 Some of our people took rides on the camels. I didn’t. They looked too high and were so odd smelling. I took pictures of them. That suited me better. The Arabs were very unhappy if we didn’t pay them we had taken pictures. Tonight we had a “Light and Sound Show” out by the pyramids. Gave the history of Egypt from way back. It was such a lovely evening, so many stars out. Was a nice event to see. We had dinner about 9, afterward we watched the boats and all the activity on the Nile River. The side of the dining room towards the River was all large windows. In the afternoon our guide took us to a Perfume Shop which was interesting. As soon as we came in, we were served tea or coffee or soft drinks. Then after that, he gave his sales talk. We bought perfume, of course. At least most of us did. Was an interesting experience. We were also to a street bazaar in the afternoon. Was interesting to bargain with the shop keepers. Some of the group did quite a bit of shopping. I just bought a ring, a real pretty one. March 9: We left Cairo early as our planes left at 7:30. When we got into the bus, one of our group announced we were all leaving Cairo Airport–24 people plus 40 camels. Seemed like everyone on the street was selling camels or cards or jewelry. Some places we could hardly walk for these sales people. We got to Beirut in Lebanon at 9:15 am; stayed until 10:40 am. Flew from Beirut to Nicosea. It is a lovely city on the Island of Cyprus. Cypress is about 150 miles long ranging from 5 to 50 miles wide. Christians who witnessed the stoning of Stephen (Acts 11:19) returned here and preached the Gospel. Barnabas and Paul also preached the Gospel here. (Acts 13:4-12; 21:3; 27:4) Leaving Nicosea at 3:00 pm. We had arrived here at 11:25 am. Had a nice lunch We flew to Tel Aviv. Got here at 4:10 pm. Tel Aviv is really beautiful, orange groves and fruit trees. We flew over the Sahara Desert right after we left Cairo. Was interesting that the Nile and the land on both sides is so green, then all of a sudden we are flying over the desert which is all sand and low sand hills. Orchards, citrus groves and flower beds are typically connected with kibbutz(es), which are often organized around agricultural activities and offer overnight lodging. We got on a bus at the airport. Our guide met us there. It was a lovely ride to Natanya where we had our hotel for the first night in Israel. We saw so many fruit orchards and green fields, really beautiful. And everyone looked much cleaner than the folks we’d seen in Cairo (or the small part of it we saw). Another difference was that there were so few children on the streets, and those we saw were in school uniforms and no one selling things. March 10: Weather: Perfect, about 70. Natanya, Hotel Orly. We have a very nice hotel here. We boarded our bus and drove to Caeserea. Was such a pretty ride: Green fields, fruit orchards and orange groves. Our guide told us how the Jewish jewelry experts and diamond miners fled from Belgium during the war because they feared persecution, and how jewels and fine diamonds have become one of Israel’s main exports. Up till this time very few diamonds were mined in Israel. Tourism is one of Israel’s big businesses also and export of citrus fruits. Also drove through the Plains of Megiddo. We drove through the Plain of Sharon on our way to Caesarea. At Caesarea–right on the Mediterranean Coast…this was an ancient port founded by Herod the Great in 22 BC. It was here that Peter baptized Cornelius and his household, the first Gentile converts (Acts 10) after the Lord had shown Peter a vision showing him that what God has cleansed, he should not call common (Acts 10:10-16). We saw the stone of Pontius Pilate, the great Roman Theatre from the time of Herod, the Hippodrome and the large aqueducts and we saw part of the ruins from a town the crusaders built. While we were sitting on the old steps of the Hippodrome and our guide had read from Acts about Peter and Cornelius, a group sightseeing in the other end of the Theater or the ruins started singing “How Great Thou Art.” It sounded so beautiful. The sky was so pretty with white fluffy clouds and the Mediterranean Sea was so blue and pretty. A scene I’ll never forget and a song I’ll never forget. We have seen many Eucalyptus trees here, also banana trees. It’s been so pretty driving along the Ocean. We passed a village of Arabs. They are so different than the Jews. Not as energetic nor as clean, but maybe there’s a reason for that. The Jews channel their rain water into ponds and raise fish there. The Jewish are so very thrifty and saving. Caesarea was built 30 years BC. Caesarea–Halvor Ronning has been our guide since we started sightseeing here in Israel. We are very fortunate to get a sincere Christian like him. He reads in the Bible about each place before we stop to look at it. And he believes the Bible, so he has really added to the enjoyment of our trip. He took seminary in Luther Seminary, but then he didn’t get a call so decided to go into language study in Germany. He also studied Hebrews and said it was so easy for him. Then he went to Jerusalem and fell in love with the Jewish people and felt the Lord had a work for him there. Ronning met a Finnish girl, daughter of Lutheran Missionaries. She loves Israel and its people like Ronning does, so they hope to stay there and do mission work. They have 3 little children. Ronning had been recommended by another Lutheran Pastor, so we were fortunate to get him. Later in the day, we drove through the plains of Megiddo. We saw Mt. Herman. It was so pretty with snow on top. Mt. 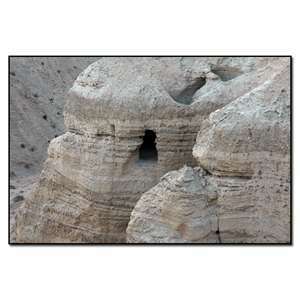 Herman is believed to be where the Transfiguration of Jesus took place. We saw (Bethsaida) where Christ fed the 5,000 and went on to Capernaum and we spent a precious hour by the Sea of Galilee. I can’t put it into words. Pastor Hedman read from Matthew 5:1-15 and John 21:13-17 and we sang “My Jesus, I Love Thee” and “Break Thou the Bread of Life” and “Beautiful Savior.” We went on to Capernaum on the Northwest side of the Sea of Galilee. Jesus came here often and taught in the synagogue. (Mark 2:1; Luke 4:31; John 6:59). He came so often it was thought of as His home. He chose Matthew here (Matthew 9:9). It was the hometown of Simon Peter and Andrew, probably where Jesus told them He would make them Fishers of Men. Jesus worked many miracles in Capernaum. He healed the centurion’s servant (Matthew 8:5-13; Luke 7:1-10); healed Peter’s Mother-in-law (Matthew 8:14-15; Mark 1:30-31, Luke 4:38-39); the man sick of the palsy (Matthew 9:1-8; Mark 2:1-12; Luke 5:18-26) and other miracles here in the synagogue. Jesus spoke the discourse on the Bread of Life (John 6:1-59); Jesus reproved the people of Capernaum because they did not accept His teachings (Matthew 11:23-24). There is so much lava rock around here, and the lava stone steps of the synagogues (hills are covered with volcanic boulders) are still there, or parts of them, and not fenced off. We can walk on them and sit on them and think about the time when Jesus was here. Thank you, Jesus, for permitting me to come here. We drove to our Kibbutz Ayelet Hashachar. Had a good dinner here. Was a real nice Kibbutz! March 11: We left after a 7:30 breakfast (by bus) for Shechem. Joseph went to Shechem to look for his brother, then they sold him to Egyptian traders)…Shechem–or Nablus. Abraham (Genesis 12:6-8) built his first altar here to worship God. Jacob also built an altar here to worship God (Genesis 33:18-20; Joseph’s body was brought to Shechem for burial (Joshua 24:31). We saw the ruins of Herod’s and Ahab’s Palaces here. At Nablus or the old city Shechem we stopped at Jacob’s well where Jesus talked about living water to the woman from Sychar. We drank water from the well. What a thrill to be here. Artist’s drawing of the Ark of the Covenant, described in Exodus 25:10-22. When Nebuchadnezzar destroyed Jerusalem in 586 BC, the Ark disappeared. Scrolls were found. Was very interesting. I had read the book G and G gave Dad in 1958, a few years after they were found (1947). Close by there we came to a small sports car that had hit loose gravel and flipped over on its top. The two young tourists driving it had crawled out and weren’t hurt, so the men from our bus helped them get it right side up and they drove off again. The top and one side was dented, but otherwise wasn’t hurt. They are still excavating around the caves. Very interesting. These caves are at Qumrum. We drove back to our Kibbutz at supper time (a different one than the night before). Not quite as nice, but we got along fine and we learned a lot about the Jewish communes. This one is close to Jerusalem. Jerusalem is 33 miles east of the Mediterranean and 14 miles west of the Dead Sea. March 12: Jerusalem. After a good breakfast (boiled eggs, cereal, grated carrots, pickled herring, pepper and onion salad, coffee, tea, bread and jam) our bus took us into Jerusalem. We were about 7 or 8 miles out of town. We walked around in the old part of Jerusalem till church time. The streets are so narrow here that no cars or buses come in here. There are many shops all along these narrow streets. So many things took place here in Jerusalem. We are left deep in thought and can’t put it into words. Jesus was brought to the temple as a tiny infant according to the Law of Moses (Leviticus 12:3) and again when He was 12 (Luke 2:40-52) and also (John 2:13-25; 7:14-53) and many other times. His final entry was when they strewed palms before Him the Sunday before He was crucified. Jesus instituted the Last Supper in the upper room here in Jerusalem (Matthew 26:17-30). We were in that room. Jesus’ trial took place in Jerusalem; and after His Resurrection, He appeared to His disciples in the city. March 13 The wall is about 50 yards long, 60 feet high. One stone is 16 1/2 feet long and 13 feet wide. 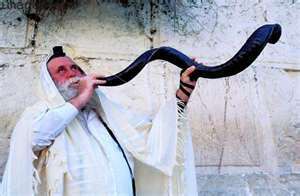 The shofar was made from a ram’s horn, and blown to signal Holy Days, here at the Wailing Wall. The octagonal shaped mosque with its golden dome and brilliant blue Persian tiles is built over what is believed to be Mount Moriah where Abraham took his son to offer to God in obedience to His command (Genesis 22:1-2). The Eastern or Golden Gate of Jerusalem was built where they thought Jesus made His triumphal entry. This gate was sealed shut in 1530 by the Turkish Governor of Jerusalem, in hope of postponing the day of Judgment and the end of the world. Many Christians believe that when Jesus comes again, the Gate will be opened and He will once again enter the Holy City. (Ezekiel 44:1-3) If it were open, it is the only Gate that would lead directly into the Temple Area. Under the Convent of the Sisters of Zion, we see some of the pavement Christ walked on and we also see the prison cell of Barabbas. We walked down the Dolorosa or Way of Sorrows where Christ carried His cross (John 19:5; John 19:13). Again, we are all quiet and have no words to express our thoughts. I think most of us are in silent prayer of thanksgiving to Christ for dying for our sins on the cross. Yesterday, we ate dinner at a cafeteria, the only one we’ve seen here. Food was real good. This forenoon, we came in on our bus and it stayed with us. I forgot to say in yesterday’s writeup that we were to a Lutheran Church that is pictured on the outside of a book Edna Andersen gave me when I was 10 years old. The name of the book “Scenes from the Holy Land.” We had a communion service there. It was a soul searching time, when we were permitted to partake of the Lord’s Supper so close by where Jesus had instituted it and also thinking about all the times Jesus had been around there. Our bus took us to Bethlehem. It is about 5 miles south of Jerusalem. That was a great experience also. The stone was rolled away so they could get in~~not so He could get out. Here’s an interesting bit about the destruction of the walls: “On September 8, A.D. 70 the Roman general Titus broke down the Jerusalem walls and captured the city. A false rumor had been spread among the Roman troops that the Jews had used gold instead of mortar to hold together the beautiful marble stones of the Temple. The soldiers thus literally pried apart every stone in their fruitless search to discover this gold.” (Wilmington’s Guide To The Bible, p. 321) The fact that no stone would be left on another in the temple walls was specifically prophesied by Christ during His ministry in Matthew 24:1, 2. Gallery | This entry was posted in History, Israel. Bookmark the permalink.